York Hall is a very old leisure centre, with not very good access for wheelchair users. In 2005 building work starts to make it more accessible for everyone. By March 2005 the reception will be accessible for wheelchairs users. After that they will make the gym, Turkish bath and changing rooms more accessible. There are 2 swimming pools and a Turkish bath (these don't have hoists). There are indoor courts where you can play badminton, basketball, volleyball, cricket or netball. There is a Fitness gym for weight training or circuit training, and a dance studio for aerobics. 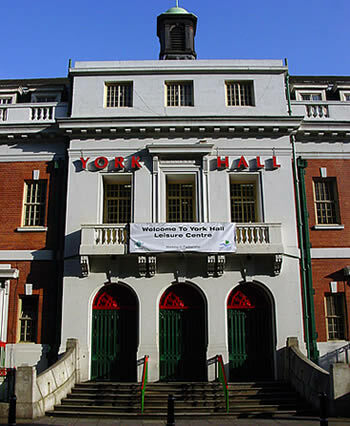 York Hall is non-smoking apart from the Hall & bar area when hired out for events. Swimming times for ladies only are Tuesday evenings (7.30 pm - 9.30 pm). Turkish baths times for ladies only are Wednesdays, Fridays and Sundays. Turkish baths times for men only are Mondays, Tuesdays, Thursdays and Saturdays. Call to check about the times. and evenings (4.00 pm to 9.30 pm). Sunday mornings (8.00 am to 2.30 pm), and evenings (6.30 pm - 8.30 pm). and afternoons (2.00 pm to 4.00 pm). Sunday afternoons (2.30 pm to 6.30pm). Bethnal Green Museum of Childhood is next door to York Hall. No accessible parking at York Hall. 8, 25 and 309 are the nearest Mobility buses. 8, 25 also run at night. (Central line) - Bethnal Green underground station is about 300 metres from York Hall. Bethnal Green underground station is not accessible for wheelchair users. Cambridge Heath mainline station is about 330 metres from York Hall. Cambridge Heath mainline station is not accessible for people using a wheelchair. There are steps up to the main entrance. The double doors are quite heavy. At the moment there is no wheelchair access to York Hall - there will be access in May/June 2005 to the reception and gym. This is an old centre and has lots of different levels. There are 3 main floors - the basement, the Ground floor and Floor 1. The smallest doorway is 765mm wide (for the accessible toilet near reception). This is for the Turkish bath. The doorway is about 900mm wide. This is where the reception is. There are vending machines here. A can of drink costs about 75p. The swimming pools, changing rooms, indoor courts and sun-beds are on this floor. The Fitness gym and the dance studio are on this floor. There are toilets on this floor - they are not accessible. There are Men's and Ladies changing rooms. The doorways into the changing rooms are standard. There are toilets in the changing rooms. There is 1 accessible toilet in each changing room on the Ground floor - it also has a baby change. They have some hand rails. They are not locked. The rest of the toilets are standard.